What is a mask for? We all wear them. For politeness, for privacy, for protection. Sometimes out of kindness. Sometimes out of fear. Think about how it feels to wear an actual, physical mask. A mask conceals identity. But a mask also expresses an identity. When you wear a mask, are you conscious of a slight separation from the everyday world? A difference in how others react to you? Do you feel yourself thinking and behaving differently? Are you able to call upon aspects of your personality that you normally suppress or find difficult to express? As you look through the “eyes” of the mask, do you find yourself seeing the world differently, noticing things you might ordinarily overlook, caring about different things than you usually do? What’s this got to do with creativity? When we’re trying to come up with creative solutions and insights, we talk about “thinking outside the box”. Great! But how, exactly, do you go about doing that? We talk about it as though it’s a special talent some people are born with. But it’s possible to learn techniques that help you approach problems from a different angle. One way is to “think behind the mask”. Because a mask can shift your perspective and literally make you think like a different person, it can be an excellent tool for stimulating creative thinking. So in this post I invite you to do a bit of mask-making and mask-wearing. Don’t freak out and decide this is going to be too much work! You can, of course, make physical masks and put them on. It’s fun, and it can be a very powerful experience, but it’s too time-consuming for me to want to incorporate into my journaling practice on a regular basis. Fortunately, it doesn’t seem necessary to actually make the mask. Drawing or painting it (or working from an existing mask image) seems to have at least some of the benefits, and takes a lot less time (and skill). Even if you “really can’t draw”, you can make images of masks. A mask is often more evocative if the “face” is not drawn realistically or in proportion, so take your drawing “errors” as simply part of the mask, or even exaggerate them! 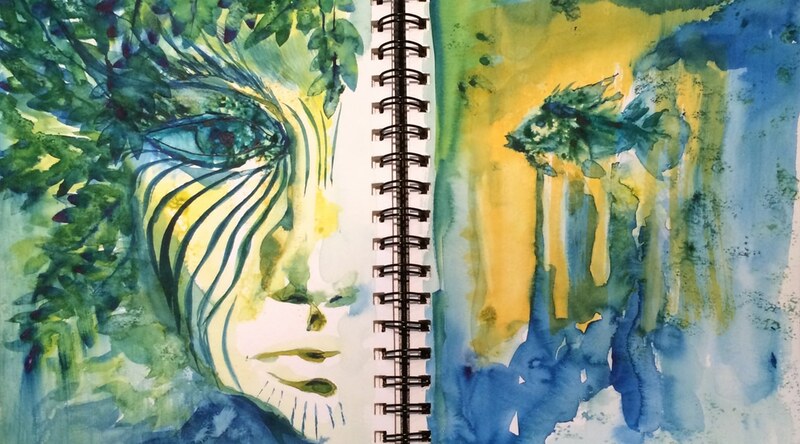 Glue a photo or photocopy of a face into your journal (yours, perhaps, or maybe just a face you find interesting or compelling), and “build” your mask by drawing or painting on top of it, and/or by gluing pieces of paper or other images over part of the face. Start with an oval or shield shape. Embellish and decorate it as though you were constructing an actual mask. Paint it, color it, add leaves, feathers, lace, string, etc. (drawn or real). Start with a mask you find interesting or compelling and alter or embellish it. Images of comic book characters and other masked figures can be found online or photocopied, and no one is going to get upset and sue you if you use such an image as an aid to creative thinking in your private journal. Look for “faces” in the world around you. I’m sure you’ve sometimes seen a face in knots in wood, or bark, or leaves, or a funny rock, a cloud, a fabric pattern, your breakfast eggs and bacon. We are programmed to see eyes and faces (even when they aren’t “really” there, so if you start paying attention, you’ll find them everywhere. Draw the “face” you found (or take a photo and glue it down) and use it as the starting point for your mask. (My personal favorite) Look for faces in earlier Creative Seeds or Directed Doodles. I don’t usually develop these images all in one sitting. Instead, I slowly “discover” them as I return to them again and again over many weeks or months. I might be flipping through my journal idly and see something I want to add, and then not revisit the image again for weeks or months. Then, one day, it will reach a point where it seems to come alive. Here’s an example of how a Creative Seed might lead to a mask drawing. I worked on these pages 4 or 5 times over several months before the mask appeared. Here’s an example of a directed doodle where I started to discover faces. It will probably get developed into a mask, or masks, at some point. This started as some directed doodling. Then I saw a face and started developing it a bit. Then I saw another face. It’s not a mask image yet but it’s probably on its way there. Step 2. Stand before the mask. Get a feel for the personality this mask expresses. Spend a little time imagining and perhaps free-writing about the entity that wears this mask. This masked figure emerged from an earlier creative seed. I saw part of the figure and then added the shield-shaped mask (easy!) and then doodled with both white and black in to bring out some of the features. Leaving out other features makes this masked figure seem mysterious and a little intimidating to me. Close-up of the mask. I used black and white ink to doodle on the Creative Seed and my shield-shape to bring out the figure and the mask. How does it feel to stand before a being wearing this mask? What sort of being do you imagine wears this mask? Benevolent? Threatening? Protective? Aloof? Friend or foe? Or neutral? Do you have a sense of age? Gender? Human or non-human? Origin? When does this being show up? What sorts of situations call to him/her/it? When would you be glad (if ever) to see this masked being arrive on the scene? When would you be worried? Frightened? Or if not you, is there someone else who should be worried, frightened, comforted, etc. when this being shows up? What are the dominant traits of this being? Special powers or magick? Vulnerabilities? Foibles? Step 3. Put yourself “behind the mask”. Now imagine you are wearing this mask. Are you aware of anything new about the being (yourself!) wearing the mask? Now that you are “behind the scenes”, does your interpretation change from what you saw/imagined when you were standing before the mask looking at it? How does it feel to be the being who wears this mask? Do you feel powerful? Serene? Burdened? Exuberant? Threatened? Wise? How does it feel to have the powers, magic, vulnerabilities and foibles of this being? How does it feel to be this being, looking out upon your earlier self standing before the mask? Do you feel compassionate? Scornful? Amused? Protective? Step 4. Call upon the mask for problem-solving. Is there a situation, choice or problem in your life that comes to mind as a fruitful place to employ this mask? How would you think or behave differently if you were this masked being, or had the aid of this masked being? Do your feelings about different alternatives change? Do you see new alternatives that you hadn’t noticed before? Can you call upon this aspect of yourself (for, of course, that is what it is!) to help you cope with a difficult situation or find possibilities that you previously dismissed? Step 5. Revisit the mask. I find it often takes some time before I understand a mask enough to use it. I also find that it doesn’t work very well for me to start with a particular problem and try to create a mask to solve it. What does seem to work is making a lot of mask images. Then, sometimes one of them will speak to me when I’m flipping through my journal to see where I want to work, and I’ll realize that it can help me think creatively about a problem that is on my mind. After I understand a mask better, I will sometimes know it is the right “person” to help me tackle a particular question, too, and I’ll go look ask it for help. And some of these masks become useful tools to “wear” in situations where I could stand to be a bit more like the being I’ve come to know behind the mask. If you think superheroes and mythical figures have no place in the “real world”, give this activity a try. You might be surprised at what—or who—you discover within you!